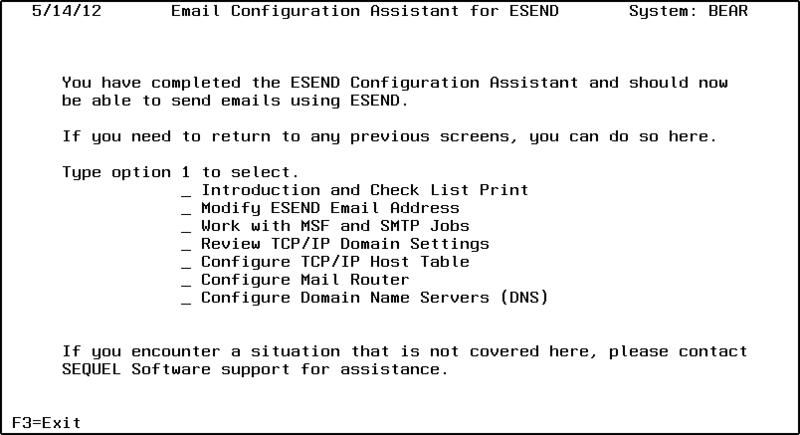 Available in version R03M36, the Email Configuration Assistant for Esend takes you through a step- by-step process to provide you with easy access to the various system and Esend commands used to successfully configure your System i to send email. If you already use email, but it is not working, you can use the Configuration Assistant to trouble-shoot your current email settings and get back up and running. 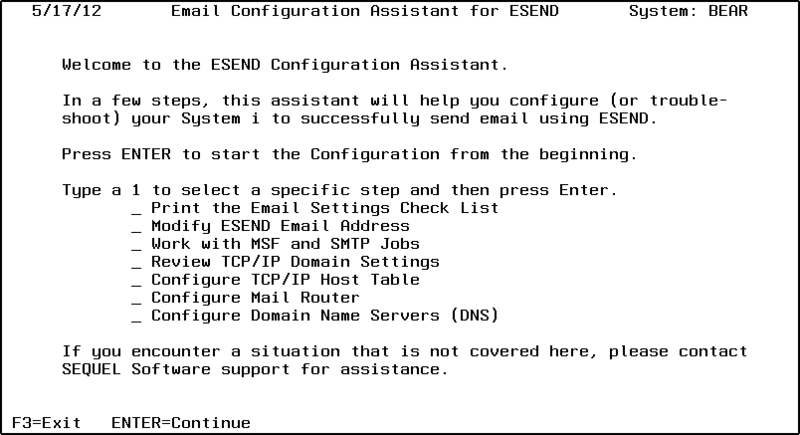 The Email Configuration Assistant for Esend is available on the Esend main menu in the Configure System (option 20) section, or you can issue the command ESETUP to start the process. You will need *ALLOBJ or *SECADM authority to run this interactive setup wizard. Note: This guide will be helpful for most users; however some systems have configuration issues beyond the scope of this guide. If you encounter a situation that is not covered in this guide, please contact SEQUEL Software for assistance. The Welcome Screen provides two ways to work with the Configuration Assistant: A step-by-step ‘wizard-like’ process, or direct access to individual steps using the menu displayed. To step through the process from the beginning, press Enter. To go directly to a specific step, place a 1 next an item and press Enter. The first step is to create the Email Settings Check List which documents your system’s current email settings. You may need to refer to some or all of this information during the setup process. 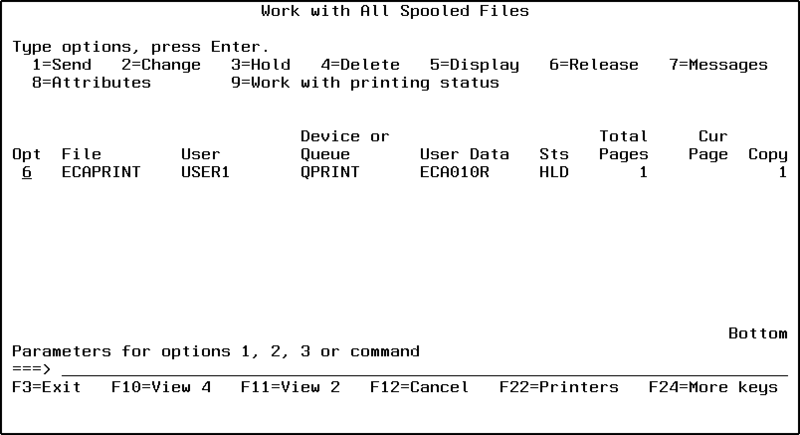 Press F6 to place the spooled file ECAPRINT in your print queue and open the Work with All Spooled Files (WRKSPLF) screen so you can release and print the check list. Place a 6 next to the file name and press Enter. Then press F12 to exit and return to the Configuration Assistant. When your check list is printed, press Enter to continue. 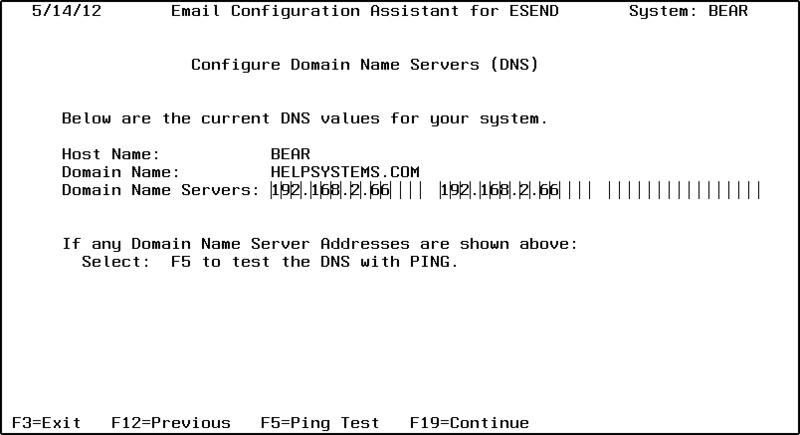 This step checks to see if you already have an ESEND email address that can be used for sending test emails during the setup process. If an address for your profile exists, it will display here. You may see a default address like ‘your_user_profile@your_system_name.domain.com’. 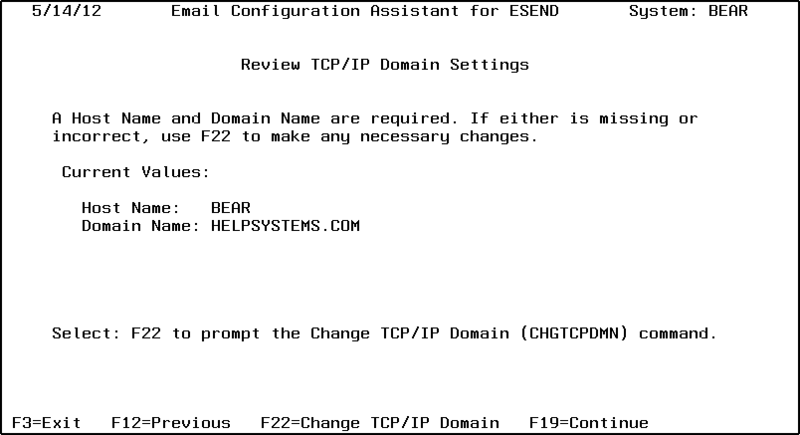 If no address is listed here, or the address listed is incorrect, you can create a new address or modify the address using the ESEND address maintenance option. Press F5 to access the ESEND address book. On the Address Book screen, you can use F6 to create an email address for your user profile, or option 2 to modify the email address for your profile. It is recommended that you use an internal email address during this setup, as emails sent to an outside address may not be so easily followed. Also, the email address should be associated with the user profile that you are using during this setup. When you are satisfied with your address, press Enter or F12 to exit. Back at the Modify ESEND Email Address screen, press F19 (shift + F7) to continue to the next step—Configure, Review, or Trouble-Shoot Email Settings. On this screen you can choose to review or trouble-shoot your current email settings, or configure email for the first time. 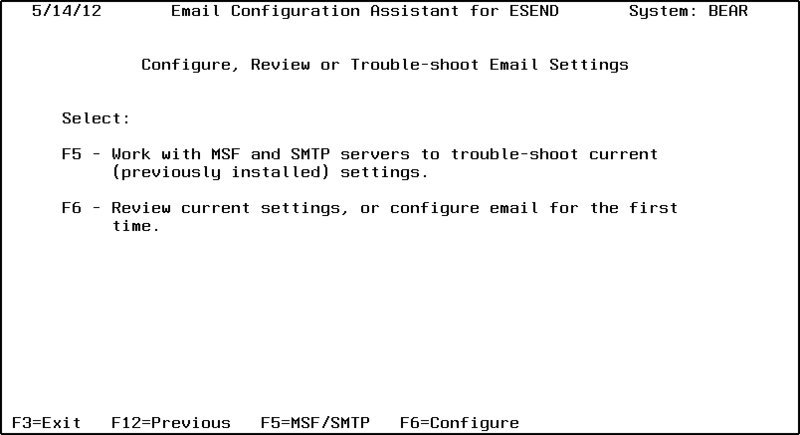 If email has been previously configured, but is not currently working, press F5 to check MSF and SMTP settings. These functions are explained in Step 3.1 below. If this is a new configuration, or if you want to review your current settings, press F6 to continue to the next step— Review TCP/IP Domain Settings (Step 3.2). For email to function properly, MSF and SMTP jobs must be active in the list of Active Jobs. In this step you can check the status of the email jobs or easily stop and restart the jobs. If your email has stopped working, this is usually the best way to get things working again. Use F5 to list the active MSF jobs. By default the system starts three MSF jobs (one or more is required to be active). If none are listed, then MSF needs to be started. 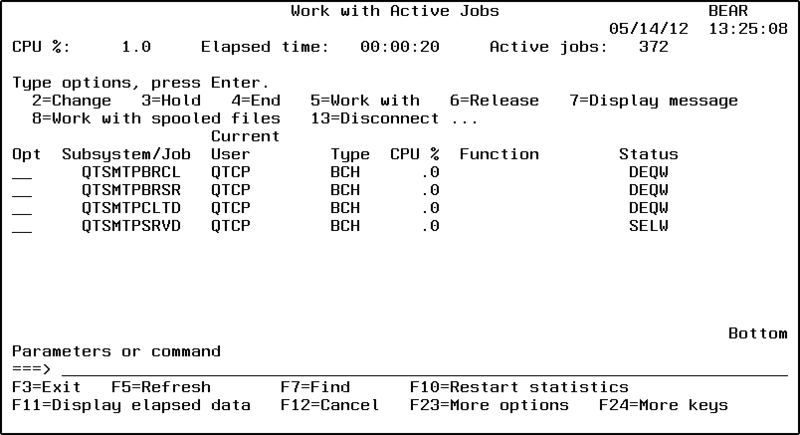 Use F3 to exit the Active Jobs display. 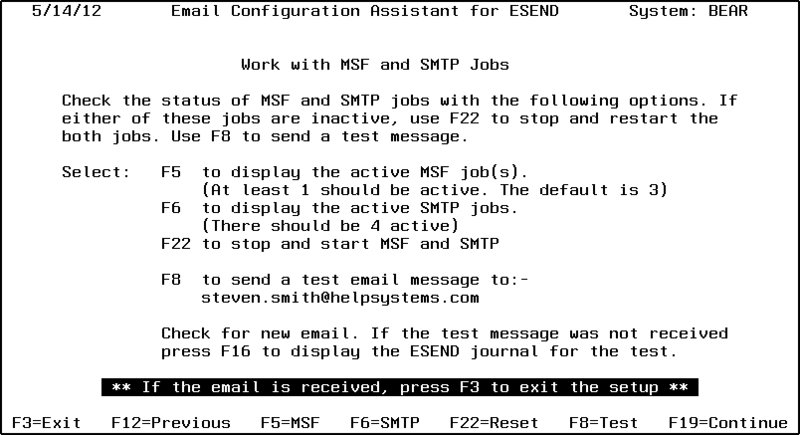 Back at the ‘Work with MSF and SMTP Jobs’ screen, use F6 to list the active SMTP jobs. SMTP needs four active jobs—QTSMTPBRCL, QTSMTPBRSR, QTSMTPCLTD and QTSMTPSRVD. The first three should have a status of DEQW and the last should have a SELW status. If all four SMTP jobs are not running or there are more than four SMTP jobs, there may be SMTP issues which need to be reset. If the list is not correct, or is empty, SMTP needs to be restarted. 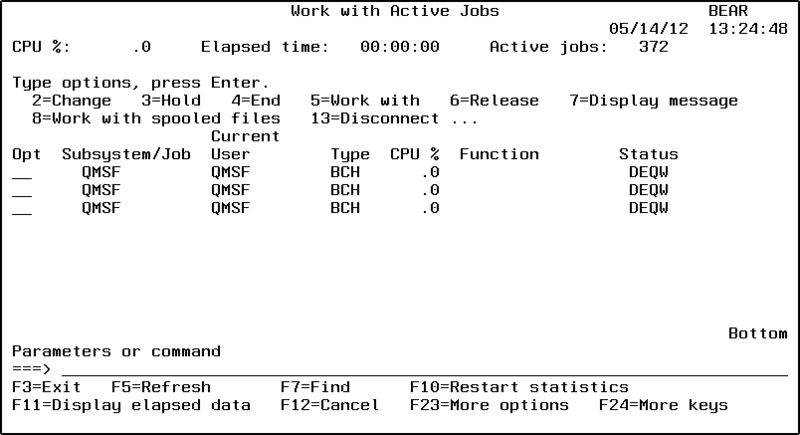 Use F3 to exit the Active Jobs display. 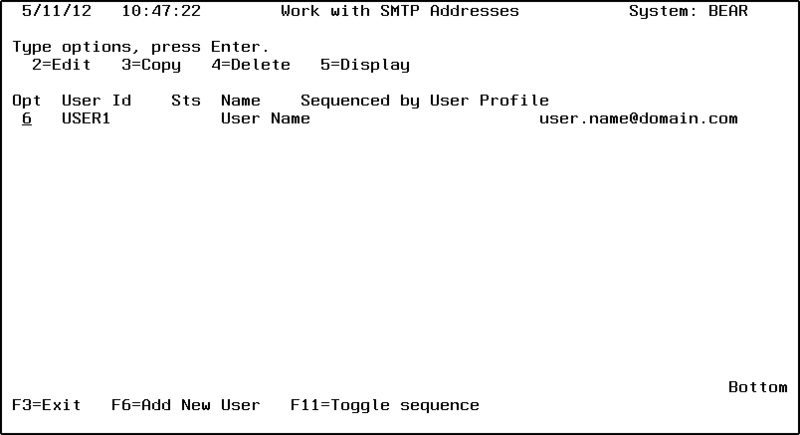 Back at the ‘Work with MSF and SMTP Jobs’ screen, use F22 to stop and restart the MSF and SMTP jobs—this option ensures the correct sequence. To check if F22 was successful, use F5 and F6 again to check the status. When you are satisfied the active jobs are running use F8 to send a test message to the email address dis- played on this screen. If an email is received, then ESEND should work. You can exit the setup with F3. 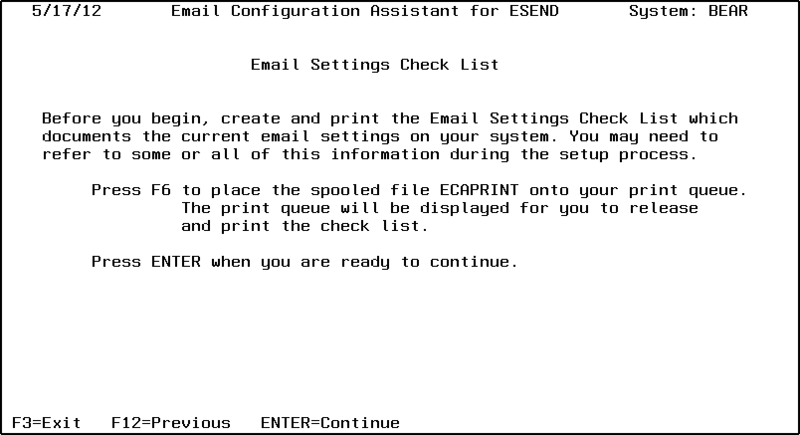 If your email is still not working, display the ESEND mail journal using F16, and keep it available to print in case you have to contact Support, should the remaining setup steps fail to resolve the issue. Press F19 to continue to the next step—Review TCP/IP Domain Settings. This screen displays the current TCT/IP domain information. This is the same information you can see using Option 12 of the ‘Configure TCP/IP’ (CFGTCP) command. A Host Name and Domain Name are required for proper email operation. 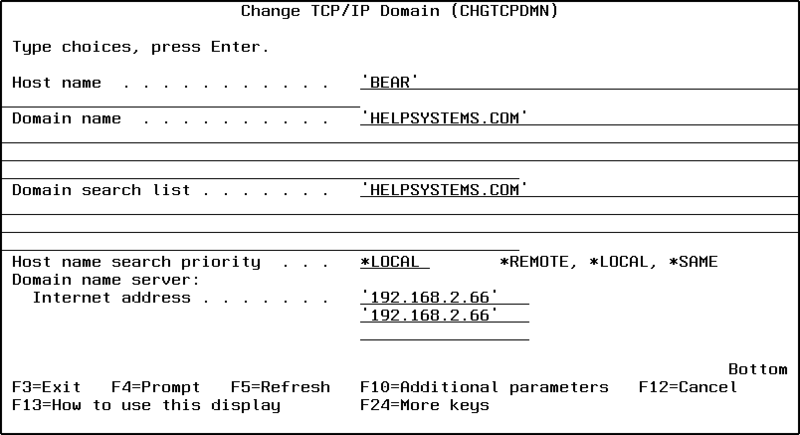 If either is missing or incorrect, use F22 to prompt the ‘Change TCP/IP Domain’ (CHGTCPDMN) command and make any necessary changes or additions. When finished, press F19 to continue to next step—Configure TCP/IP Host Table. 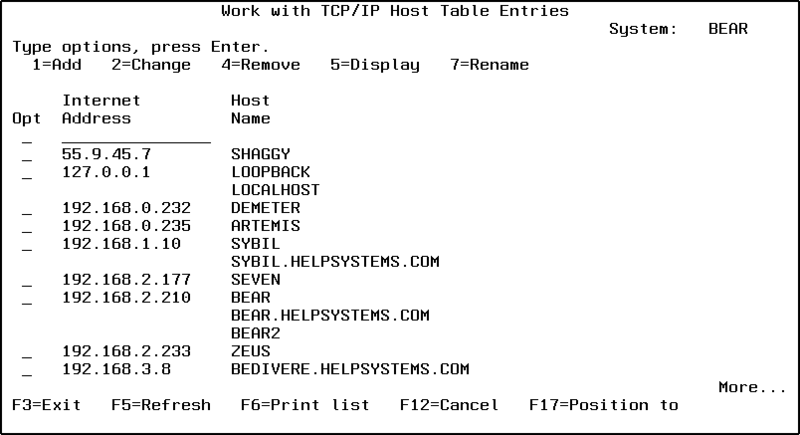 This screen displays the relevant information from the TCP/IP Host Table required for email to function properly. There should be an entry for either the Host Name, or a combination of the Host Name (dot) Domain Name (shown on the previous screen or listed on the Email Settings Check List). Either one or both will work provided they have the same IP address—the IP address listed for your system in the Email Settings Check List (printed at the start of the setup process). Use F5 to open the ‘Configure TCP/IP’ (CFGTCP) menu and enter Option 10 to ‘Work with TCP/IP Host Table Entries’. On this screen, use option 1 to create an IP address entry if it doesn’t exist, or option 2 to modify the IP to include the Host Name and/or the Host (dot) Domain Name entry. When finished, press Enter and F3 to return to the Configuration Assistant. Back at the Configure TCP/IP Host Table, press F19 to continue to the next step—Configure Email Router. There are two methods for routing mail to an email address: Relay the email to a system (mail router) that is set up to route your email (this is the preferred method) ,or specify a Domain Name Server (DNS) that can resolve the email domain and continue the process. This step focusses on the Mail Router op- tion. If your system requires a mail router to forward email, you can register your router here. The mail router currently defined is displayed. If no mail router is listed (you will see *NONE), check with your System Administrator for the name. 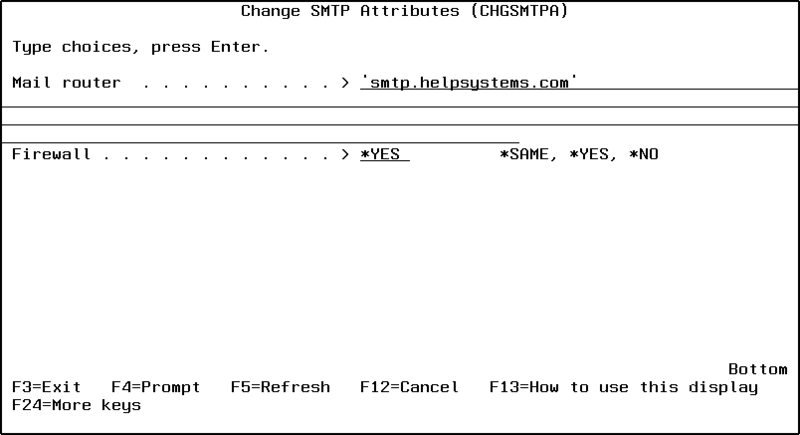 Use F14 to prompt the Change SMTP Attributes (CHGSMTPA) command (shown on the next page), and add the mail router name. Then, use F22 to stop and restart the MSF and SMTP jobs. To verify the mail router is working correctly, use F5 to start a TELNET session on that remote system. 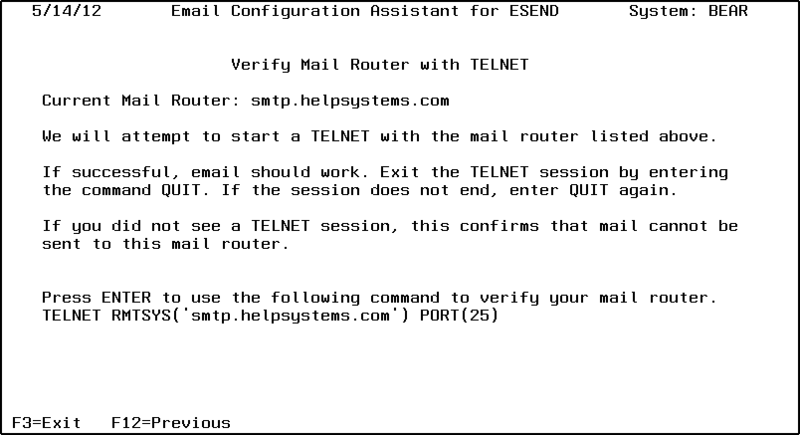 On the Verify Mail Router screen, you will use TELNET to see if the System i can access your mail router. Press ENTER to test TELNET. If successful, you will enter a TELNET session with the router shown on the screen. This tells us email should work. Exit the TELNET session by entering the command “quit” one or more times and return to the config assistant. If TELNET failed, check with your Network Ad- ministrator to ensure you have the correct Mail Router. 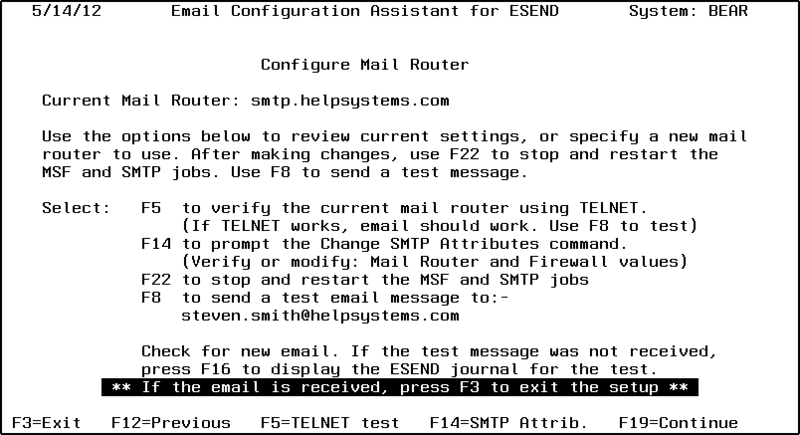 Back at the Configure Mail Router screen, use F8 to send a test message to the email address displayed on this screen. If an email is received, then ESEND should work. You can exit the setup with F3. 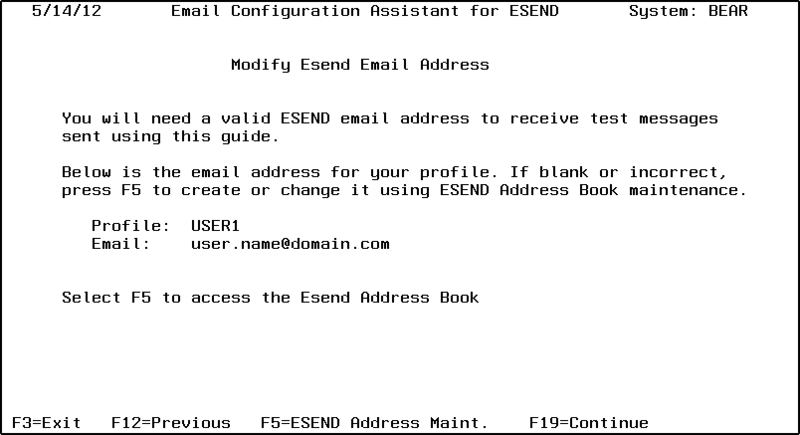 If your email does not arrive, you can use F16 to display and print the ESEND journal. 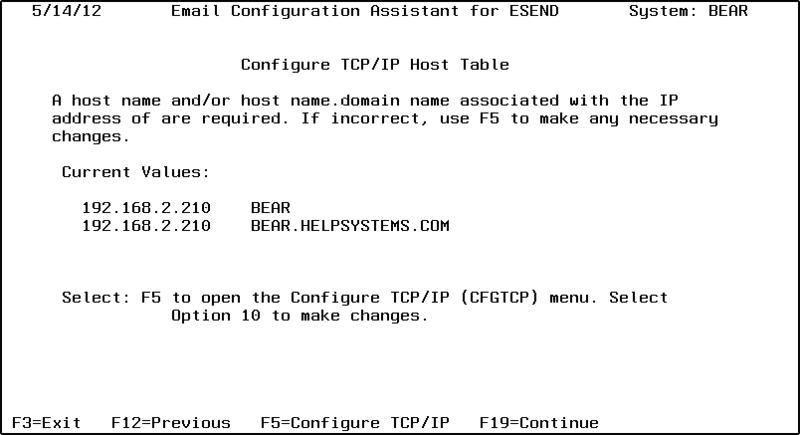 If you need to change the Mail Router use F14 to prompt the Change SMTP Attributes (CHGSMTPA) command. This shows you just the relevant parameters of Mail Router, Firewall, and if you are on V7R1 or higher, the Forwarding Mailhub server. If you are using a mail router, set the FIREWALL parameter to *YES. If you are on V7R1the Forwarding Mailhub Server must be set to the name of the mail router. After any changes to the mail router, you must use F22 to stop and restart the MSF and SMTP jobs. Then use F8 to send a test message. Here you will review and define the alternative method for routing mail from the System i—through the Domain Name Server (DNS). The DNS specifies the IP address of a system, Intranet or Internet, used to resolve an email domain name into an IP address. In order for the DNS to send mail, the attributes of SMTP will have to be changed. It is probably best to involve your System Administrator before making these changes. To test the capability of the DNS, use F5 to ping SEQUEL-SOFTWARE.com. If the ping is successful, you will quickly see a “Passed” message on your screen. A failing ping may take a little while depending on your system, and will eventually show the message “Failed” on your screen. Press F19 to continue to the Review page. Here you will see a list of the steps that you have been through. Type option 1 next to any item to review those settings. Press F3 to exit the Configuration Assistant.